Either player would require the 21st overall pick, are they worth it for the Bengals who already nose tackles in place? Mark J. Rebilas-USA TODAY SportsFor all of us that follow the draft closely, I always have an appreciation for the end of March. It signifies the start of the final stretch of the always rational and uneventful draft season. But, as long and strenuous the wait between early February and late April maybe, it does start flying by around this time. And there’s still a good amount of work for procrastinators like yours truly. In an attempt to not only release scouting reports more efficiently, but to also change up the loose format I’ve been using, I’m going to give you a few “prospect vs. prospects” pieces, starting with this one that features two highly regarded interior defensive lineman. Let’s meet our two very large human beings in question. Excluding a two-year drought from 2015 to 2016, Alabama has had at least one defensive prospect drafted in the first round every year since 2010, including three in last year’s class alone. Just in the past two draft classes, they’ve had four defensive lineman drafted in the top 60. They don’t rebuild in Tuscaloosa, they reload with Grade A ammunition; and Da’Ron Payne is a lock to be the fifth interior defender to hear his name called very early in the draft. A mere 2,500 miles northwest, head coach Chris Petersen has boosted his resume for turning Washington into a legitimate threat in the college football landscape as the rest of the PAC-12 has taken a few steps backwards. In his first year in 2014, he saw nose tackle Danny Sheltongarner Vince Wilfork comparisons as he wrecked havoc his senior year and found himself going off the board in the top half of the first round in the 2015 NFL Draft. 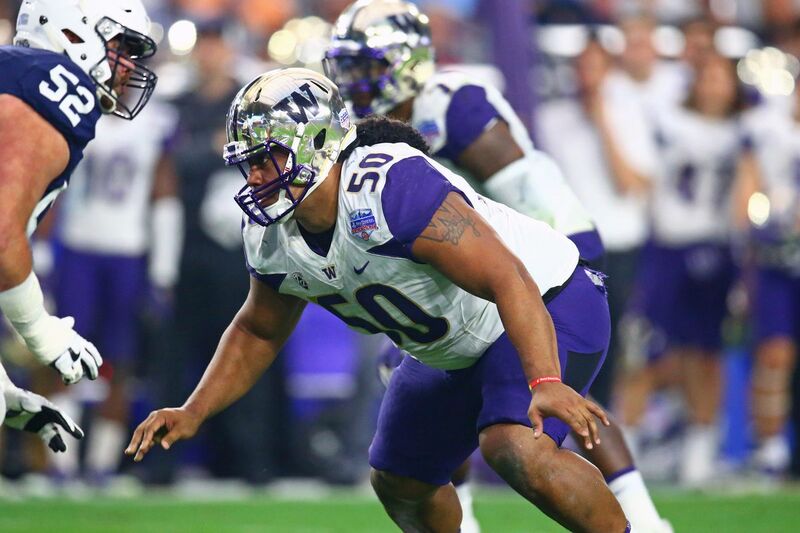 Three years later, Vita Vea is looking to follow in Shelton’s footsteps. Payne and Vea are both consensus first-round talents by most draft outlets and are expected to hear their names called sometime in the top 32 picks. But how do they separate themselves from each other? To start out, let’s look at what we can quantify. The biggest asset for both players in my opinion is their relative athleticism. Each player plays with superb balance and can explode laterally on a dime for their size. At the combine, we got to see Payne complete a full testing course and the results were very good for his official size of 6’2” 311 pounds. Unfortunately for Vea, he injured his hamstring while running his 40 yard dash and was sidelined for the rest of the drills at the combine. He sat out at Washington’s pro day as well to avoid further injury to his hamstring. His 5.1 40 time is the sole time/measurement we have to confirm his athleticism, but with it being such an impressive time for his size, it’s going to be enough for most teams. If he’s so much faster than some offensive lineman that are 40 pounds lighter than him, you can imagine what his explosion and flexibility testing would’ve looked like. This is where the profiles of these two get sketchy. The term “box score scouting” refers to using traditional statistics as the primary reasoning behind judgement of a player. While stats do not tell the whole story, they are an important part of the puzzle in telling what kind of impact a prospect can make on the professional level. All non-quarterbacks who appear on the stat sheet and produce at a level well above average relative to their team’s total production are the players who become Pro Bowl and All-Pro players. Production is where both Payne and Vea lack compared to other a-gap defensive lineman in this class. It’s concerning that neither player accumulated many tackles behind the line of scrimmage. Even for nose tackles, getting penetration and pressure means the most when it turns into negative plays. But where these two differ in this lack of production is their age. Payne won’t turn 21 until a month after he’s drafted at the end of May. Vea on the other hand turned 23 in the beginning of February. Being slightly on the older side, Vea was producing at an at best average level at 21 and 22 years old when he was starting. Payne on the other hand didn’t see significant playing time until this past year at 20 years old. This doesn’t give Payne a pass, but it’s a factor to consider in his below average production. Separating production in the form of solo tackles, tackles for loss and sacks tells you what the strengths and weakness of that defensive lineman are. And they always show up on tape, so let’s finish with that. In the simplest of labels, Payne and Vea are projected to be nose tackles in the NFL. But they were used in more alignments than directly over the center. In Alabama’s scheme, Payne was the 0T when they were in a base odd front, and moved over to 3T in nickel packages and even fronts. As a pass rusher, Payne is at the very least intriguing for how easy he can cross the face of a guard and explode through a-gaps. Be it a simple club move or an inside swim, Payne showed promise as a downhill force, but couldn’t find a way to finish outside of two half sacks. There’s at least a base with Payne, and his future d-line coach is going to appreciate his hand usage from the beginning. But his ceiling will be capped pretty low with less than desirable snap quickness and explosion. These issues fuel the consensus that Payne will truly make his money holding and closing gaps on first and second down. Payne is so good at getting his hands up quick, maximizing his length and creating space for himself. That allows him to flow with the play with control and utilize his excess power in the form of ragdoll-ing guards and centers when he’s in the epicenter of the point of attack. You can’t do this any better. With his head up and eyes in the backfield, Payne again flows with the direction of the blocking while keeping his outside shoulder clean and fulfilling his gap responsibility. Using one arm instead of two, Payne creates space to cross over to the backside a-gap that the running back thinks is open. He thought wrong. The Sugar Bowl against Clemson and the National Championship against Georgia is where Payne stepped up his consistency and despite still not making an impact in the backfield, he played much better on a snap-per-snap basis. This is Payne at his best. He completely resets the line of scrimmage two-yards in the backfield, gets off the block and wraps up the ballcarrier. For as much of a brute Payne is, Vea has about 30 clean pounds on him and is even more explosive out of his stance and can generate a significant increase in force, and was incredibly obvious at times. It’s pretty rare to see the tackle on a tackle-end stunt to acquire the sack that’s schemed for the end to obtain. It’s equally rare to see a player like Vea carry so much force and distribute it so violently upon impact. Kolton Miller, a potential first-round selection at left tackle, stood zero chance in staying in the way of Vea and Josh Rosen. Speed to power, just on an unadulterated level. To some teams like the Dallas Cowboys, Vea may be looked at as a three-down player, and the pressure he can cause shaded over the center and guard’s outside shoulder will be highly coveted to go along with his rare size. Like Payne, Vea’s bread and butter will be as an extra large A-gap plug, and Vea plays with such balance to go with his tremendous ability to drop his anchor and hold ground. 350 pounds going up against about 600 pounds in the form of a combo block typically favors the latter. And initially, it did. Just like a guard who takes a hop step backwards to re-anchor against a bull rush, Vea gets slightly off-kilt and resets his base and reasserts himself in position to record the stuff. Taking on double teams without giving up ground is so crucial for linebackers filling run fits, but disengaging from them entirely as the running back is just entering the hole is another level of impressive. The classic nose guard in an odd front consisting of 3 down lineman is a responsible for both A-gaps. He has to be able to cross the center’s face depending on which gap the running back decides to attack. In this RPO by Fresno State, the quarterback decides to let the running back attack a light box. Initially, Vea fills the right A-gap, forcing the back to cut back to the weakside A-gap. Vea accordingly discards the center and meets the back at the line of scrimmage. In a sentence, Payne and Vea are very good A-gap stuffers who have the ability to provide pressure but an inability to finish plays in the backfield. Both players have similar skill-sets, but Vea’s superior size and brute strength and balance makes him more of a prototype and therefore more of a coveted talent. Payne’s advantage over Vea comes in the form on being two years younger with the possibility of his best productivity still to come, while Vea’s ceiling is very likely already established. For these reasons, it’s clear why some may prefer Payne and some may prefer Vea. The one conclusion I’ve reached on both of them is, despite how athletically gifted and talented they are, they simply didn’t produce at a level indicative of a high quality NFL player. Does that mean they won’t be starters for a long time? No, I think that’s a very reasonable expectation for both of them, but the nose tackle position is undervalued as it is with the NFL defense being mostly nickel. Is it wise to use a top 30 pick on one if he isn’t the next Damon Harrison? I’m in the opinion of no, but it all depends on what you value. The Bengals defensive tackle group is pretty crowded as it is at the moment as well, and currently has more nose tackles than under tackles. You can survive on first and second down with Chris Baker and Andrew Billings as your 1-techniques. The addition of either Payne or Vea would be welcomed, but at the expense of addressing more pressing issues, they aren’t in a position to invest such capital in on another nose tackle. And it’s very possible that the Bengals won’t get a chance to draft at least one of them. Payne and Vea are the textbook examples of defensive lineman who excite you with pressure and overall athleticism, but leave you wanting more from a production standpoint. Based on their current draft stock, they’re probably going to get overdrafted not because they aren’t talented, but because they’ll have expectations that are too high for what their output in college was. It would be best if the Bengals watched that happen instead of making it happen. I just don't think they value the position enough to spend premium draft capital on it. I could see them taking a 3 technique, maybe, but don't think they would invest a high pick on a 0/1 technique kind of tackle. Think they would take the highest rated corner or tackle before Vea or Payne. Same reason I don't think they would take a guard in round 1, but they did it with Zeitler, so what do I know.. I think it depends a little on how much faith they still have in Billings. But I’d pass on Payne a lot more easily than Vea. I wouldn't complain much if either was drafted, but no....I don't want a new NT. In fact, I don't want the ones they've already got. Making matters worse, Vea reminds me too much of Danny Shelton. That may impress some but I remind you Shelton is already on his second team...and was traded for peanuts. As for Payne, he opened eyes at the Sugar Bowl, but that's part of the problem. Where was that kind of play before? Not interested in Tim Settle in the 2nd or 3rd rounds either. As mentioned in the article...you can roll with Baker and Billings this year, and look for a replacement next season if neither impresses. I get why the Shelton-Vea comparisons are there because of looking similar and both going to Washington. But Vea ran a 5.10 while Shelton ran a 5.64. Seems like there's quite a bit more athletic upside with Vea. I like Settle but I wouldn’t use a 2nd or 3rd on him. Re: Vea he’s a better athlete than Shelton but the fact that he disappears for stretches is a concern... although that seems to be the case for a lot of interior DL in college. I do like Payne a lot... after starting 2 years ago but sharing time with Allen and Tomlinson (and before that, Jarran Reed and A’Shawn Robinson-crazy talent Bama has) he seemed to step up his game last year, especially late. Whether that means that his best football is ahead of him, who knows... but I’d take Vea, Payne, Hurst, or Bryan if they went for an interior DL at 21. I hear that Dallas really likes Vea and is spending a lot of time on him, and that they see him as a 3-down player. But who knows, maybe they’re blowing smoke. I also expect Billings to improve quite a bit over his rookie year... carrying 325+ on his frame after a serious knee injury takes time to come back from... obviously not the same player but Geno Atkins struggled his first year back, too. I think confidence and trusting the knee is part of it, also. Last edited by texbengal; 04-05-2018 at 08:42 PM. This incoming DT class will be an interesting case study in terms of "breakout age." There's been a strong correlation in the NFL draft of younger players (20 and 21 year olds) having more successful careers than guys who entered the draft at 22, 23 or older. And a similar/related correlation between guys who "breakout" (show college production) at a younger age having more success than guys who don't make an impact in college until older. If you buy into this trend, Payne becomes more interesting. He started multiple games on a loaded Bama line as an 18-year old true freshman. Won the starting job as a 19-year old sophomore and was arguably the best player on the field in the CFB Playoffs as a 20-year old. He'll still be 20 on draft day. Vea is already 23 years old. He didn't see the field in college at all until he was 20. Had his first 5 starts when he was 21. Became a full-time starter at 22. Interesting to consider - thanks for sharing that. Based on some stuff I've been reading, seems like Payne is a fast-rising prospect and might be taken ahead of Vea. Same deal with Edmunds at LB. I think he's the youngest guy entering the draft and while he may not have as much experience as, say, Roquan Smith, he's got immense physical talent and may just be "scratching the surface." If you buy into this trend, Payne becomes more interesting. I do, actually, but for me it goes beyond a comparison of ages. I'm often attracted to players whose greatest asset is pure upside, whether realized or not. I'm not afraid of players who aren't finished products because I know what a player did in college very often doesn't translate to the pros. As a result I'm not surprised when a prospect like Vea is often ranked higher than his counterparts. Based upon his past level of play he deserves to be. But when it comes to pulling the trigger as often as not I'm more attracted to the younger player with higher upside. For example, Tavon Bryan or James Daniels.